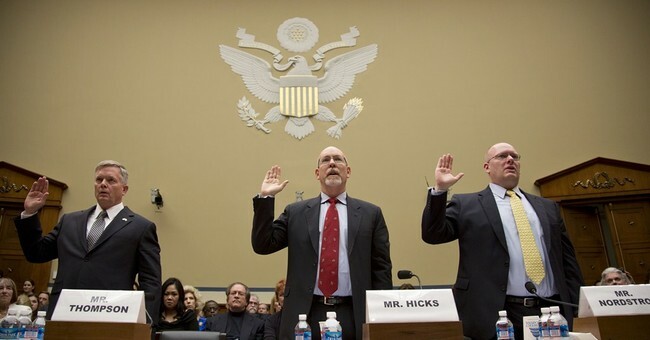 (1) Murdered US Ambassador Chris Stevens' second in command, Gregory Hicks, was instructed not to speak with a Congressional investigator by State Department lawyers. * Hicks said he'd "never" faced a similar demand at any point during his distinguished 22-year diplomatic career. When he refused to comply with this request, the State Department dispatched an attorney to act as a "minder," who insisted on sitting in on all of Hicks' discussions with members of Congress (higher quality video is available here). Sec. Hillary Clinton's chief of staff, Cheryl Mills, later excoriated Hicks for cooperating with the investigation and permitting himself to be interviewed without a chaperone. (2) When Hicks began to voice strenuous objections to the administration's inaccurate talking points with State Department higher-ups, the administration turned hostile. After being lavishly praised by the president and the Secretary of State for his performance under fire, Assistant Secretary of State Beth Jones instantly reversed course and launched into a "blistering critique" of Hicks' leadership. He was subsequently "effectively demoted." Hicks called Rice's talking points "stunning" and "embarrassing." Questions: How, why, and by whom did the administration's talking points get scrubbed and re-written? Why did the president refuse to identify the attack as terrorism in an interview with CBS News on September 12, and why did he allow Sec. Rice to disseminate patently false information on his behalf? (4) A small, armed US force in Tripoli was told it did not have the authority to deploy to Benghazi in the midst of the attack. Twice. Flight time between the two cities is less than an hour. Members of the would-be rescue contingent were "furious" over this obstruction. The witnesses said they did not know who ultimately gave the "stand down" orders, or why. If it was not the Commander-in-Chief calling the shots, why not, and where was he? Whistle-blower Mark Thompson, a career counter-terrorism official at State, said he called the White House to request the immediate deployment of a Foreign Emergency Support Team (FEST) to Benghazi. He was told it was "not the right time" to do so, then was cut out of the communications loop. Furthermore, the Benghazi compound was operating below the bare minimum global security standard for US diplomatic missions -- despite being in an exceedingly dangerous place, and having been subjected to previous attempted attacks. Only the Secretary of State has the authority to grant exemptions for minimum security requirements. (6) Amb. Stevens was stationed at the vulnerable Benghazi compound on a dangerous symbolic date at the behest of Sec. Clinton, who wished to make that diplomatic mission a permanent outpost. This detail should only intensify questions as to why the consulate was so poorly protected (see item #7). (7) Nordstrom stated that elements of the lightly-armed Libyan militia group tasked with protecting the consulate were "certainly" complicit in the attacks. No US Marines were present at the time. Hicks estimated that at least 60 terrorists swarmed into the compound during the attack. Eight months later, zero arrests have been made. (8) A mortally wounded Amb. Stevens was taken to a hospital controlled by the Islamist extremist group (Ansar Al-Sharia) primarily responsible for the assault. Administration officials initially pointed to locals rushing Stevens to a local hospital as evidence of local goodwill from protesters who didn't approve of the mob spinning out of control. Hicks said the American contingent did not go to retrieve Stevens from said hospital during the fight because they were fearful that it was a trap. (9) The US government did not seek permission from the Libyan government to fly any aircraft into Libyan airspace, aside from a drone. The witnesses testified that they believe the Libyan government would have complied with any such request. The fact that none was even made indicates that there was never a plan or intention to rush reinforcements to Benghazi. This renders the "would they have made it on time?" argument largely irrelevant -- the facts in item #4 notwithstanding. Another important point about the "they wouldn't have made it" defense: The assault lasted for eight hours and took place into two waves at two different compounds. How could anyone have known how long the fighting would last? How could they have anticipated that ex-Navy SEALs Woods and Doherty wouldn't have been able to stave off the enemy for a few more hours? Help was not on the way. It was never sent. (10) Despite committee Democrats' repeated claims and leading questions, reduced funding or "austerity" had absolutely nothing to do with the inadequate security presence on the ground. The State Department itself made this fact crystal clear at previous hearings, as did the administration's internal "ARB" review. Why did multiple Democrats flog an obsolete, thoroughly-debunked explanation, if not to muddy the waters? (11) Oversight Democrats tried to cast doubt on Mark Thompson's credibility, suggesting that he'd declined to participate in the administration's ARB probe. Thompson corrected the record, noting that he "offered his services" to those investigators, who in turn did not invite him to testify. Democrats also claimed that the House hearings were slanted because the leaders of the ARB investigation were not invited to participate. In fact, Chairman Issa explicitly did invite them, as confirmed by letters obtained by ABC News. They chose not to participate. Democrats were dead wrong on both counts. * An earlier version of this post stated that Cheryl Mills directly instructed Hicks not to meet with Rep. Chaffetz. Though Mills likely had a hand in that edict, Hicks testified that unnamed higher-ups at State actually issued it. Both Mills and Beth Jones subsequently dressed Hicks down for defying the effective gag order.